CLEVELAND -- The man who randomly killed a Cleveland retiree and posted video of the crime on Facebook shot himself to death on Tuesday in Pennsylvania, police said. Pennsylvania State Police said Steve Stephens was spotted Tuesday morning in Erie County, in the state's northwest corner. Authorities say officers tried to pull Stephens over and, after a brief pursuit, he shot and killed himself. He was wanted on an aggravated murder charge in the shooting death of a 74-year-old man who was picking up aluminum cans on Sunday after spending Easter with his family. Stephens posted a video of himself killing Robert Godwin Sr., a former foundry worker who had 10 children, police said. In it, he said, "I snapped, I just snapped." Stephens, 37, shared a recording on Sunday of himself announcing his plan to kill someone, then two minutes later posted another video of himself shooting and killing Godwin, Facebook said. A few minutes after that, he went live and confessed, the company said. The company said it disabled Stephen's account within 23 minutes of receiving the first report about the video of the fatal shooting and two hours after receiving any report. Facebook has since announced it was launching a review for reporting harmful content. Police would not speculate on what was behind the killing, but videos Stephens posted showed him talking about losing everything he had to gambling and trouble with his girlfriend. Stephens filed for bankruptcy two years ago despite holding down a job as a counselor helping young people develop job skills and find employment. The behavioral health agency where he worked said an extensive background check before he was hired turned up nothing worrisome. In one video posted on Facebook, Stephens said that he gambled away everything and that he and his girlfriend had planned to marry but did not, without saying why. In the video of the shooting, Stephens told Godwin the name of his girlfriend and said, "She's the reason that this is about to happen to you." Godwin did not seem to recognize the name. The woman Stephens spoke of, Joy Lane, said in a text message to CBS that "we had been in a relationship for several years. I am sorry that all of this has happened." Investigators said that Godwin was the only victim so far linked to Stephens, despite his claim on Facebook that he killed over a dozen people. 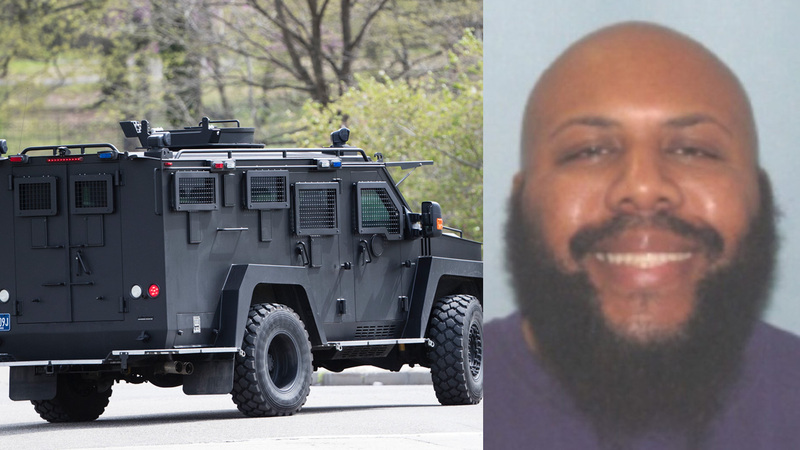 Officers searched dozens of places around Cleveland without finding Stephens or any other victims before expanding the manhunt. Detectives spoke with the suspect on Sunday by cellphone and tried to persuade him to surrender, police said. Within a day, authorities expanded the search nationwide and offered a $50,000 reward for information leading to his capture and prosecution. Law enforcement officials said on Monday that his cellphone was last tracked Sunday afternoon in Erie, Pennsylvania, about 100 miles (160 kilometers) east of Cleveland. Associated Press reporters Michael Rubinkam in Pennsylvania, Dake Kang and Delano Massey in Cleveland, John Seewer in Toledo and Dan Sewell in Cincinnati contributed to this report.